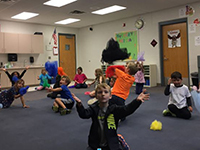 Clarkston Community Schools' fine and performing arts programs are designed to provide an environment in which students can pursue interests and skills in a variety of performing and creative arts. Students experience the joy of expressing and appreciating art through a variety of mediums. As a musician and educator, I often mention the value of "music for music's sake." It's a phrase used commonly in our field, but what does it really mean? There are many benefits to learning to read and make music, and there is plenty of research to support these benefits. From advances in reasoning and problem solving to increased scores in math and reading, the ways in which music makes a better learner are endless. But these skills can be honed in a number of ways in a number of classes. So what is it that makes music special and unique? For as long as humans have existed, so has art. A flute made of bone, cave wall paintings and ivory carvings, elaborate Egyptian burial decor, a keyboard made of mammoth bones. We see evidence of art from tens of thousands of years ago that surely wasn't created or utilized because of a need to improve M-STEP scores. Why are the arts important then? Well, why did you brush your hair this morning? Why did you paint your walls or sing "Twinkle, twinkle little star" to your babies? Why did you pick out that card for your grandma's birthday? What was the point? Surely not simply to meet some physical need, like food and water. And yet, like food and water, we've never existed without the arts. To understand its role, we have to be willing to look beyond our tangible needs. We are more than the hours of sleep we steal or the pounds we weigh. We have emotions, feelings (dare I say, souls?) and a desire to express and communicate them with one another. How many people today do you know who are out of touch? So many lack the ability to empathize, especially in a digital landscape. But with art, we come a little closer. Music has the power to move those invisible pieces inside of us. It lightens our bodies when we feel tired or weak, allows us to sink into our sadness and pain, explore our power and motivate our minds. And as we play in the band or sing in the choir, we allow those experiences to become shared ones. We no longer suffer or celebrate or laugh alone. We feel, and we make our audiences feel. Is there a reason beyond that? Is there a reason needed? "You're not here to become an entertainer, and you don't have to sell yourself. The truth is you don't have anything to sell; being a musician isn't about dispensing a product, like selling used Chevies. I'm not an entertainer; I'm a lot closer to a paramedic, a firefighter, a rescue worker. You're here to become a sort of therapist for the human soul, a spiritual version of a chiropractor, physical therapist, someone who works with our insides to see if they get things to line up, to see if we can come into harmony with ourselves and be healthy and happy and well." Our fine and performing arts courses are designed to function using a spiral curriculum, where skills are introduced in beginning coursework, revisited and refined throughout subsequent grade levels. Through exploration, play, and experiential learning, young artists and musicians are building toward developing skills that have the power to propel them into a career in the arts. Higher level thinking skills spring from personal expression as students pursue their passions and develop their unique talents and artistic crafts. Clarkston fine and performing arts programs have an excellent reputation for producing outstanding young musicians and we owe much of that success to the support of our students' families. The Clarkston Schools Instrumental Music Association (CSIMA) provides both moral and financial support to the 6-12 grade instrumental music programs of Clarkston Schools. CSIMA members serve as a resource to the instructional staff of the Clarkston Schools instrumental music programs by volunteering our individual skills and performing the fundraising necessary to enhance the school district’s funding of instrumental music programs. CSIMA meetings are the second month of every Monday of the month from September through May. The Clarkston Choirs Booster Organization (CCBO) was created to support and promote all Clarkston choirs. All Clarkston residents are welcome to attend CCBO meetings, which are held each month (usually on the second Thursday) from August through May. Kindergarten - How do art materials work? What is art? First Grade - What are different kinds of artists? How do artists use or show patterns? Young artists get a unique view and strong foundation of connecting and expressing his or her real world as an artist. Art class is an exploration of wonderful opportunity that enriches and provides deeper meaning to your child's life. In the lower elementary music classroom, students will engage with music through exploration, exposure, and play. Students will develop essential skills such as: matching pitch with a singing voice, keeping steady beat with instruments and the body, listening and moving expressively, and becoming familiar with these elements of music (form, timbre, melody, harmony, rhythm, expressive qualities). The goal of music classroom is to foster a curiosity and joy for music that will extend into upper elementary and beyond. The young artist will experiment with a variety of media and art making techniques including but not limited to drawing, painting, collage, ceramics and printmaking. Students will have the opportunity to have their artwork displayed and share their artwork with others. In music, all students participate in concerts, sing-a-longs, celebrations and school meeting presentations (may vary by building). Separate music classes are also offered for students with learning, behavioral, or emotional needs. 3rd - How do artists show organization in our world? 4th - How do we connect to art from other cultures and times? 5th - How do artists impact our world? Your growing artist gets a unique view and strong foundation of connecting different subject matter. Art class is a wonderful opportunity that enriches and provides deeper meaning to your child's life. In upper elementary, music education encourages self-growth through community. Students will express themselves creatively through these essential skills: singing, composing, improvising, expanding their understanding of music literacy, and listening to an increasingly diverse repertoire of music. Additionally, students will play a variety of instruments from the percussion, string, and woodwind families. The goal of the music classroom is to encourage students to become critical thinkers who will develop into independent lifelong learners through music-making. The growing artist will experiment with a variety of media and art making techniques including but not limited to drawing, painting, collage, ceramics, printmaking, and much more. Students will have the opportunity to have their artwork displayed and share their artwork with others. In 4th grade, students have an incredible cultural experience of taking a trip to the Detroit Institute of Arts. In music, all students participate in concerts, sing-a-longs, celebrations and school meeting presentations (may vary by building). Fourth grade students take a field trip to Detroit Symphony Orchestra, fifth graders visit Clarkston High School for secondary ensemble performances. In upper elementary school, instrumental instruction in basic keyboard, ukulele, recorder, and percussion skills (may vary by building) are available. Separate music classes are also offered for students with learning, behavioral, or emotional needs. All fine arts courses in Clarkston Community Schools are designed to function using a spiral curriculum, where skills are introduced in beginning coursework, revisited and refined throughout subsequent grade levels. Growing artists are continuing to develop visual literacy skills. Students will learn how to create, discuss, apply higher level thinking skills, and form their own opinions and judgments. Here at Clarkston Community Schools, our success is not defined by any single metric, but by a variety of measures that reflect this distinctive set of values. Look beyond standardized test scores and wonder about what makes a great learner. The arts work to shift from binary thinking: "right" or "wrong" answers, and instead pushes students to think critically about the choices they make stylistically or otherwise. Students are taught that significance can be made through qualitative, not quantitative information. It is difficult to argue that there is not a “right” or “wrong” answer in music, as a wrong note is certainly in the realm of possibility. We can push students to see beyond right and wrong; that there is a level of understanding achieved beyond “just” right and wrong. This is even reinforced at the state level, for example, through the MSBOA and MSVMA festivals, for example, where “Style” and interpretation are in their own category and play an equal part in the overall rating of a performance. When it comes to interpretation, there may be many “right” ways. In the arts, there is no bench. Students are not excluded from participating because of a lack of ability or talent. The expectation is the same for every student in the room, and thus the player's responsibility is to the other members in the group. Students learn to hold themselves accountable for the information presented because of an intrinsic desire to improve the quality of their craft. As they progress, students acquire the knowledge necessary to identify and correct an incorrect pitch or rhythm using their auditory processing skills. They must also have the ability to concentrate on a task while processing what they are hearing, viewing from their conductor, and seeing on their canvas. Students have to be able to imagine various solutions to possible problems to create an artistic piece or a passage of music that is an accurate representation of what has been composed. It takes courage to create sound publicly every day and share a personal art form. Students create, play or sing for individually, in small groups, and large ensembles every day and subject their work to critique by peers and instructors. A student learns to lead when he or she feels confident in his or her abilities, comfortable with those he or she is leading, and supported intellectually and emotionally by his or her instructors. We provide these opportunities daily. We build our team, year after year, and grow a community of kind, hard working people who all want the best for each other, because it's what's best for the ensemble. These courses are designed to teach students the fundamentals of music performance. Beginning in 6th grade and continuing through 7th grade, skills introduced include instrumental technique, music literacy, and an introduction to stylistic interpretation. Students learn the fundamentals needed to make informed musical decisions. Students will perform in concerts throughout the year including one adjudicated Band/Choir/Orchestra festival performance in 7th grade. Students can also choose to participate in Solo and Ensemble Festival through the Michigan Schools Band and Orchestra Association. Additionally, students will develop leadership abilities and interpersonal skills, working independently and in collaborative ensembles. This is Mrs. Pagel's 8th year of teaching and third year with Clarkston Community Schools, teaching sixth grade band and choir and 8th grade band. She is an assistant director of the high school marching band and director of CHS flute choir. Mrs. Pagel earned a Bachelor of Music in Music Education and a Bachelor of Music in Flute Performance from Central Michigan University in 2010. She is currently pursuing a Master of Music in Conducting from Oakland University. Last summer, she and her husband welcomed their daughter Adelaide. In her free time she enjoys gardening, baking, and photography. Mr. Taylor is currently in his fifth year of teaching, and his 4th with Clarkston Community Schools. Prior to coming to Clarkston, Mr. Taylor taught for one year in Concord, MI. Along with teaching middle school band and orchestra, Mr. Taylor is an assistant director of the High School Marching Band and director of the CHS Percussion Ensembles. In addition to teaching in Clarkston, he taught Redline Percussion for four years and the Madison Scouts Drum and Bugle Corps for one year. He is also an educational artist with Innovative Percussion Inc. He received his Bachelor's degree in Music Education from Michigan State University and Master of Music in Music Education degree from Central Michigan University. He was a member of the Cavaliers Drum and Bugle Corps from Rosemont, IL for 4 years and served as a drum sergeant during his last season. He was also a member of NorthCoast Academy from Saginaw, MI for 5 years and served on the leadership team for 3 years. Mr. Taylor is an active member of MSBOA and MCBA, having served on executive boards with both organizations. Along with teaching music, Mr. Taylor designs shows and writes music for several groups across the country. In his free time, he enjoys reading, kayaking, and spending time with his fiance Lindsay. These courses are designed to build upon the fundamentals of music performance. Skills learned at a younger age are improved, including instrumental technique, music literacy, and stylistic interpretation. Students continue to refine the fundamentals needed to make informed musical decisions. Students will perform in concerts throughout the year including one adjudicated Band/Choir/Orchestra festival performance. Students can also choose to participate in Solo and Ensemble Festival through the Michigan Schools Band and Orchestra Association. Additionally, students will continue to develop leadership abilities and interpersonal skills, working independently and in collaborative ensembles. Mr. Harris is in his 14th year of teaching in the Clarkston School District. He loves teaching band at Clarkston Junior High School. He also teaches the Clarkston High School Jazz Band and is an Assistant Director of the 160 member Clarkston High School Marching Band. He received his Bachelors of Music Education degree from Central Michigan University and Masters of Public Administration with an emphasis in Educational Administration from the University of Michigan-Flint. His main instrument in college was the trombone and he performed in many concert bands, jazz bands, the Chippewa Marching Band, orchestra, pit orchestra, jazz-bone, and trombone choir while at Central Michigan University. His wife Katie is also a music teacher in Clarkston. They have one wonderful daughter and one terrific son. Mr. Lewis is in his twenty-third year of teaching instrumental music. After teaching two years in the Ubly Community School District, he became the Associate Director of Bands in Clarkston, a position he held for nine years. Mr. Lewis is currently in his fourteenth year as Director of Bands at Clarkston High School where he conducts the Wind Ensemble, Symphonic Band, and Symphonic Wind Ensemble and is director of the Marching Band. Under his direction, the Clarkston High School Symphonic Wind Ensemble has performed at the Michigan Music Conference, the American School Band Directors Association National Convention, the Central Michigan University Concert Band Symposium and the Western Michigan University Spring Conference on Wind and Percussion Music. Mr. Lewis received both his Bachelor of Music Education Degree and Master of Music Education Degree from Central Michigan University. He studied bassoon with Mary Beth Minnis, saxophone with John Nichol and conducting with John Williamson. As an active member of the Michigan School Band and Orchestra Association (MSBOA), Mr. Lewis served as President, Vice President for Band and Orchestra, and Treasurer in District IV. At the state level of MSBOA, he served as chairman of the Music Education Committee and is currently serving as a member of the Music Selection Committee. Mr. Lewis regularly adjudicates both district and state Solo and Ensemble and Band and Orchestra Festivals. Mr. Lewis was both a Clarkston Foundation Teacher of the Year Nominee and has twice been the Band Teacher of the Year for District IV of MSBOA. He has been a member of the American School Band Directors Association since 2001. These courses are designed to teach students the fundamentals of music performance. Beginning in 6th grade and continuing through 7th grade, skills introduced include vocal technique, music literacy, and an introduction to stylistic interpretation. Students learn the fundamentals needed to make informed musical decisions. Students will perform in concerts throughout the year including one adjudicated Band/Choir/Orchestra festival performance in 7th grade. Students can also choose to participate in Solo and Ensemble Festival through the Michigan Schools Vocal Music Association. Uniformity is extremely important for performances. When members of an ensemble are dressed alike, the ensemble appears as one unit and those in the audience are more apt to hear the entire group rather than focusing on individual students. If a family is unable to provide any part of the SMS Concert uniform, please contact your director by the end of September. 6th Grade Uniform: Students are to wear black shoes, black dress slacks or a skirt of appropriate length, black socks, black tights or hose, and a white, long-sleeve, button-front shirt. You may also be asked to purchase a Clarkston Choirs t-shirt. 7th Grade Uniform: Students are to wear all black shoes, black dress slacks or a skirt (knee length or longer), black socks, black tights or hose, and a white, long-sleeve, button front shirt. You may also be asked to purchase a Clarkston Choirs t-shirt. Michael Peterson has been teaching choral music for 25 years. His first three years were in Reese Public Schools as a general music teacher grades first through sixth grade and choral director of the Middle and High School Choirs. He has spent 15 years at Clarkston Community Schools directing the High School, Junior High, and Middle School Choirs overseeing 5 daily choir’s, and the music director of the annual musicals. He also spent 6 years as Director of Choirs at Walled Lake Northern High School. While there he directed 4 daily choir’s, and was the producer and music director of the annual musical. Musicals he has been the music director include: Annie Get Your Gun, Anything Goes, Bye Bye Birdie, Camelot, Carousel, Chitty, Chitty Bang Bang, Damn Yankees, Guys and Dolls, Jekyll and Hyde, Les Miserables, Oklahoma, Once Upon A Mattress, Sound of Music, South Pacific, Tarzan, 25th Annual Putnam Spelling Bee, Wizard of Oz, Mary Poppins and this year Hairspray. While at Clarkston his choirs have performed in New York City, Chicago, St. Louis, and internationally at the Tuscany Choral Festival held in Montecatini Terme, Italy. He is the MSVMA District IV manager. Michael received his Bachelor of Music Education with a conducting emphasis, studying with Dr. Nina Nash-Robertson at Central Michigan University. He then returned there later to get his Masters of Music in Voice Performance, studying with Mr. Timothy Caldwell. He is an inaugural member of M.E.M.E. (Michigan educators Male Ensemble) that promotes male singing in schools. He has been married for 25 years to Kate Peterson and has 2 daughters, Grace and Madeline, both graduates of Clarkston High School. These courses are designed to build upon the fundamentals of music performance. Skills learned at a younger age are improved, including vocal technique, music literacy, and stylistic interpretation. Students continue to refine the fundamentals needed to make informed musical decisions. Students will perform in concerts throughout the year including one adjudicated Band/Choir/Orchestra festival performance. Students can also choose to participate in Solo and Ensemble Festival through the Michigan Schools Vocal Music Association. Detroit Voice is a Clarkston High School a cappella group that sings only music originating in Michigan and Motown music. Detroit Voice has recorded two full length albums "Sounds Like Home" (2012) and "More Than Motown" (2017). They are also featured on "Clarkston A Cappella, Volume 1" in which they have a song featuring Delilah from the show The Sing Off. Detroit Voice has performed for Pentatonix, were featured performers of the Legends of Doo-Wop Tour, appeared at Motown Night for the Detroit Tigers, and were featured performers at the National A Cappella Convention in Memphis and the National High School A Cappella Festival in Kettering, Ohio. 6th Grade Uniform: Students are to wear black shoes, black dress slacks or a skirt of appropriate length, black socks, black tights or hose, and a white, long-sleeve, button-front shirt. 7th Grade Uniform: Students are to wear all black shoes, black dress slacks or a skirt (knee length or longer), black socks, black tights or hose, a white, long-sleeve, button front shirt, and the SMS band vest (provided by the music department). The vest must be returned at the end of the school year. Wendy Stuart is in her 19th year of teaching Orchestra in Clarkston. Before coming to Clarkston, Ms. Stuart taught for one year in the West Clermont Local School District, a suburb of Cincinnati, Ohio where she started a new string program. Ms. Stuart has been a private cello teacher for over 20 years (although she is no longer teaching lessons). She was also an Adjunct Professor at Concordia University in Ann Arbor, teaching String Techniques. Ms. Stuart is the Conductor of the Philharmonia Orchestra, part of the Oakland Youth Orchestras. She is in her seventh season with OYO Philharmonia, a full orchestra of around 100 students. Ms. Stuart has a Bachelor of Music degree in Cello Performance from Eastern Michigan University, where she graduated with honors. She then attended the University of Michigan, where she obtained her teaching certification and a Masters of Music, Music Education. Additional education includes conducting workshops in Stavanger, Norway and Biarritz, France. Ms. Stuart regularly attends and presents at music educator conferences throughout the country. Wendy Stuart served on the Executive Board of the Michigan Chapter of the American String Teacher Association, where she was elected as Secretary for three terms. She also served as the Director of the MASTA String Camp, Session III, a week long camp held in the summer for six years. She spent one year as Membership Chair for MASTA. In addition to teaching, Ms. Stuart regularly performs on her cello throughout the southeast Michigan area. She is Principal Cellist of the Oakland Symphony Orchestra, serves as assistant principal cellist for the Saginaw Bay Symphony and plays regularly in other area Orchestras. She also performs at many weddings and other special events throughout the year with a small string ensemble. Ms. Stuart enjoys traveling, including many trips to Norway, China, Germany, Italy, England, Austria, France, and other locations. She also enjoys spending time with her husband, friends, family and two cats, reading and working on her house. Theatre training encourages engagement and has a positive impact on academic, emotional and social development. Kids who participate in theatre programs take a unique set of skills with them throughout their lives, making them more creative, confident and productive individuals. But the best part of getting involved in Clarkston theatre programs is that they're fun! Hairspray, Rated PG-13 Based on the New Line Cinema film written and directed by John Waters. In cooperations with Music Theatre International. It's 1962 Baltimore during the civil rights movement, and the lovable plus-size teen, Tracy Turnblad, has only one desire---to dance on the popular "Corny Collins Show". When her dream comes true, Tracy is transformed from social outcast to sudden star. She must use her newfound power to dethrone the reigning Teen Queen, win the affections of hearththrob, Link Larken, and integrate a TV network...all without denting her 'do! Rated PG-13 for strong language and mature content. The Sunday matinee is an interpreted performance for the deaf. Sorry, this production is now closed. Please be certain of you purchase before finalizing your transaction. This is a reserved seating show. To make sure you can sit with your family and friends, you will want to purchase your tickets in the same transaction. All guest, including infants and toddlers, must have a purchased seat. If you have specialized seating needs, such as wheelchair access, please make your ticket arrangements by calling 248-623-4024. Do not purchase your tickets online, you must call the box office. Your emailed receipt will act as your tickets. Please check your spam mailbox should you not receive an emailed receipt shortly after purchase. You need to print this receipt and bring it with you the night of the show. You can also show us this receipt via your phone. Please have it ready before you approach the theatre door. Was drama club your home away from home? Never been on stage before but love watching live theatre? You can help keep theatre and the arts alive in Clarkston! Theatre is an incredibly expensive venture and the CHS Drama Club is self funded. Every year we participate in the Patrons, Angels, and Saints donation drive to help offset the costs of our theatrical productions. Every donation, no matter how big or small helps! All donors (received by our printer's deadline) will be listed in our program for everyone to see. Between the straight play and the musical, your generous gift will be recognized by over 5000 people! 1972 - "Once Upon A Mattress"
1973 - "Sound of Music"
1974 - "Fiddler On The Roof"
1977 - "Guys and Dolls"
1978 - "King and I"
1979 - "Annie Get Your Gun"
1981 - "Once Upon A Mattress"
1981 - "West Side Story"
1982 - "Paint Your Wagon"
1983 - "Guys and Dolls"
1985 - "Kiss Me Kate"
1988 - "My Fair Lady"
1990 - "Annie Get Your Gun"
1991 - "Once Upon A Mattress"
1993 - "Wizard of Oz"
1994 - "The Pajama Game"
1995 - "Bye Bye Birdie"
1997 - "Guys and Dolls"
2001 - "Crazy For You"
2003 - "How to Succeed In Business Without Really Trying"
2004 - "Once Upon A Mattress"
2005 - "Annie Get Your Gun"
2007 - "Sound of Music"
2012 - "Thoroughly Modern Millie"
2013 - "Disney's Beauty and The Beast"
2015 - "Bye Bye Birdie"
1992 - "Up the Down Staircase"
2005 - "Cheaper by the Dozen"
2006 - "The Yellow Boat"
2010 - “Father of the Bride"
2011 - "Justice in Dusty Junction"
2017 - "The 25th Annual Putnum County Spelling Bee"
2018 - "The Diary of Anne Frank"
Learning to draw and think creatively helps prepare students for the future! Learning to paint, create a website, or design an energy-efficient home requires mastering skills that are developed through a strong visual arts education.